The Golden Hare Spectra has proved to be a reliable catcher of fish on a variety of waters. The back is made of Spectraflash 11 and is highly reflective, but also very thin giving off just the right amount of translucent sparkle. Thread : Rusty brown 8/0. Tail : Hare's body guard hair. Back : Spectraflash 11, dark brown. Rib : Medium oval gold tinsel. Underbody/Thorax : Medium lead wire, optional. Abdomen : Dubbed hare's ear fur. Thorax : Dubbed hare's ear fur with an over dub of hare's body guard hair. Dennan UV Drop Gape Nymph. 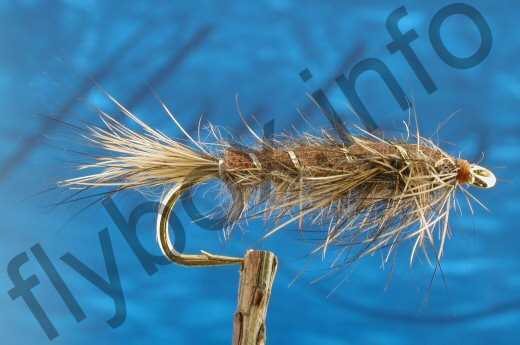 Currently there are no comments about the Golden Hare Spectra fly pattern from other fly fishermen yet.